Pure has launched a new high-end iPod speaker dock at CES and we popped to the Pure booth to have a quick look at the new device. 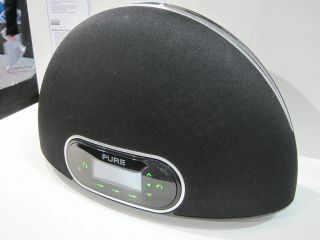 The unit is also a DAB and internet radio and it's fully compatible with Pure's Flow internet-connected technology. Although this unit was wired in, it's fully Wi-Fi enabled. You can also view videos from your iPhone or iPod through composite, S-Video and component outputs. The Contour will cost £200 from the end of January and is clearly aimed at those willing to spend, but who don't want to stretch to the offerings from the likes of Arcam, Bose and Bowers & Wilkins. As you can see, the actual dock can pop back into the front of the unit so it needn't be sticking out when you're listening to the radio. You can also stream audio from a computer or networked device using the contour, as well as play content from Pure's Lounge portal. Pure told TechRadar that it will be releasing an upgrade to a second, much improved version of the Lounge portal over the coming weeks.